One of the most well-known sites on the Preston skyline is to be converted back into a hotel - nearly 70 years after it last welcomed guests. Councillors have approved plans for the former Park Hotel to be returned to its original use, along with the construction of a new pavilion, spa and a replacement office building on the site. The hotel, which overlooks Miller Park, will accommodate around 200 guests - with 71 rooms in the historic building itself and a further 44 on the upper floors of the new office block. That building will replace a 1960s structure which housed council staff until it was vacated in 2011. The single-storey pavilion to the east of the hotel will host a 500-capacity banqueting suite and kitchen area and will boast an external terrace looking out across Miller and Avenham parks. Meanwhile, the spa will be created as part of the partial demolition and refurbishment of a listed building on East Cliff, which also previously functioned as offices. Lancashire County Council’s development control committee heard that the majority of the work needed to restore the hotel building - which is not listed, but was once likened to a “Disney castle” - will be carried out internally and will have no effect on its appearance. Committee member Kevin Ellard described the plans, which include conference facilities, as “a no-brainer”. Will East Cliff be able to cope with an increase in traffic? “This is about regeneration and making excellent use of our built heritage - and we will all be delighted to see the back of the [council office] building,” he said. A nearby resident, Andrew Isaac, spoke largely in support of a scheme which would “see the demolition of one of the ugliest buildings in the area and put back into appropriate use one of the most attractive”. But he wanted reassurance about potential noise from the pavilion affecting his own property - and park users. While lobbies had been ruled out by the applicant, an amendment from committee member Carl Compton - requiring the end walls of the pavilion to be constructed out of suitable acoustic material to reduce the risk of disturbance to neighbours - was voted through. Papers presented to the committee revealed that Preston City Council had wanted the pavilion’s doors and windows to remain closed during live entertainment. But county council planning officers concluded that such a requirement would “detract from the venue” and that a promised sound limiter would automatically cut out music if it exceeded a pre-determined level. Planning conditions mean live and pre-recorded music must end by midnight, because of the lower than usual urban noise levels in this part of the city overnight. Concern was also raised over the impact on traffic and parking in the area, with another resident, Gary Richardson, warning the committee that drivers unfamiliar with the area could “come unstuck” negotiating illegally-parked cars along the narrow East Cliff, at times when traffic enforcement is not in operation. 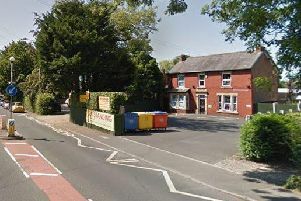 The county council’s highways department was requested to investigate measures such as bollards to prevent vehicles being parked in the area. The hotel car park will have space for 124 vehicles, with more than a hundred of the current spaces being lost as a result of the pavilion. But the committee heard that the hotel’s “sustainable location” should ensure visitors made use of alternative forms of transport or parked at other facilities nearby. As part of the plans, Vicars Bridge - which links with the site - will be replaced. A footpath which currently runs from the parks towards the city centre - although not a public right of way - is expected to be retained. Preston City Council had raised objections about the design of the office building, describing it as “a standard approach which doesn't take into account the landscape setting”. They also questioned the suitability of the materials being used for the pavilion. Following earlier objections - which also came from Historic England - the applicant removed a storey from the office block to make it “subservient” to the hotel itself. Papers presented to the committee revealed that construction materials for the new buildings will reflect the red-brick style used elsewhere on the site - but would add a “modern element”, featuring stone cladding and glazing. Historic England has since withdrawn its opposition in view of the modified design and the committee heard that trees would provide a "screening effect" for the offices when viewed from the parks. Lancashire County Council’s pension fund acquired the hotel site in 2016. Its staff will occupy the lower floors of the new office block. The Preston-based Cassidy and Ashton and Frank Whittle Partnership are working together on the development. The Preston City Centre Action Plan, drawn up in 2013, described the “significant opportunity” to attract more staying guests. It was estimated that the city would require an additional 500 hotel rooms by 2027. The Park Hotel, with its commanding views over Miller and Avenham Parks, was originally the family home of the Simpsons who owned Preston’s famous gold thread works. It was bought jointly by two railway companies and opened as the Railway Station Hotel in 1883 to serve the increasing number of first class passengers coming in and out of Preston Station during a golden era for rail travel. For almost 70 years it was owned by the railways and British Transport Hotels – it even had a covered walkway connecting it to the station. In its heyday, The Park played host to the Prince of Wales (later to become King Edward VII), as well as Prime Minister Stanley Baldwin and entertainer Gracie Fields. But it was sold in 1950 to the county council for use as offices, a move which was opposed in Parliament by Preston North MP Julian Amery because of what he described as a “great shortage” of hotel accommodation in the town. LCC moved out in 2011 and put the building on the market in 2012 to raise money to offset government budget cuts.